W3_Zakiya_Which Gadget is Preferable to Buy? This method is similar with satisficing method, because attributes will be compares to some standard measurement. The different is, this method will evaluate each alternatives on the best value achieved for any attributes. If an alternative has just at least one attribute that meets or exceed the standard, that alternative is kept. By applying this method, alternative B is has a big probability to be taken out from buying consideration. This left us 2 alternatives, Gadget A and C that need to be considering buying. 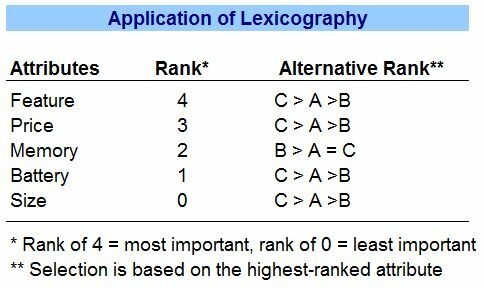 But since gadget C has 4 best values than alternative A, than we can decide that alternative C is the chosen alternative. On this method, each attributes will be compared on one to another. The alternative which has the highest value for the most important attribute is then chosen as the best alternative. But when two or more alternatives has identical values for the most important attributes, then the 2nd most important attribute must be specified and used to break the deadlock. This will keep continued until all the alternatives have been evaluated. On below table, I have compared each attributes to another and ranked them according to the number of times it appears on the left hand side of the comparison. It turns out that “Feature” is the most important attributes that I considered on choosing a boarding house. 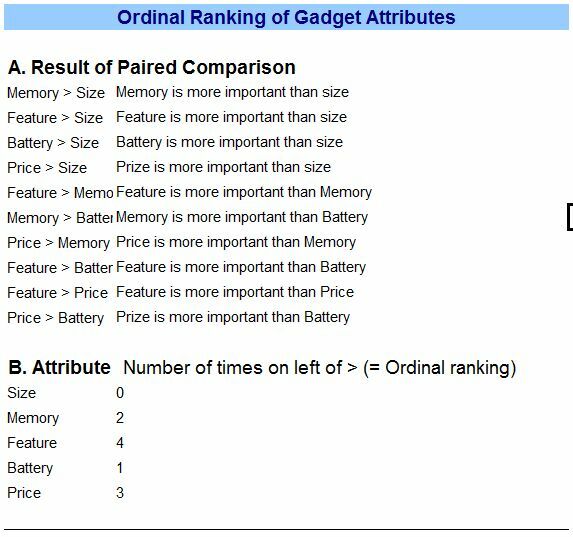 The 2nd important is “Price” and followed by “Memory” and “Battery”. Size is really are just an additional consideration and least important among others attributes. Now, on below table we compare each alternative on each attributes to decide which boarding house is the best one. We will start on the most important attributes which is “Feature”. On this attributes alternative C is the best one. This result is also shown from attributes “Price”, “Battery” and “Size”, only attribute “Memory” that alternative C is lack in. 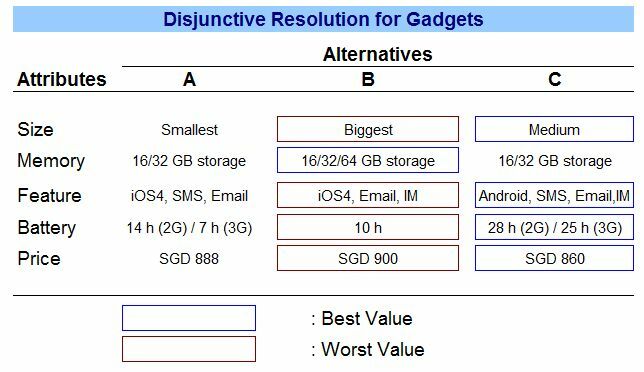 Therefore we can decide, from this method the chosen one is Alternative C.
In summary, by using Multi-Attributes Decision Making especially on Noncompensatory Models, we can decide that Samsung Galaxy Tab is the best alternative. Make sure that the gadget work as in specification especially for battery and the feature offered. The warranty and after sales service must be ensure to anticipate any future damage. This entry was posted in Group Member, Nurul Zakiya, Uncategorized, Week #3, Weekly Submission. Bookmark the permalink. 2 Responses to W3_Zakiya_Which Gadget is Preferable to Buy? AWESOME, Bu Z!!! I especially appreciate your robust analysis as I am trying to make exactly the same decision!!! Now I really need you to get going on your PAPER!!! I just got back from facilitating a couple of work shops for your CFR’s at the Project Summit in KL last week and I can assure you, there are no shortages of “opportunities” for you to explore in a paper. So once again, you did an outstanding job on your Blog posting this week and I look forward to seeing you explore other tools/techniques in the coming weeks!! PS: Too bad your W3 report was a week late…. Why not post your W4 report today or tomorrow and get it out of the way? By doing this, your team will get benefit of the Earned Value…….